The idea of the Anthropocene often generates an overwhelming sense of abjection or apathy. It occupies the imagination as a set of circumstances that counterpose individual human actors against ungraspable scales and impossible odds. There is much at stake in how we understand the implications of this planetary imagination, and how to plot paths from this present to other less troubling futures. 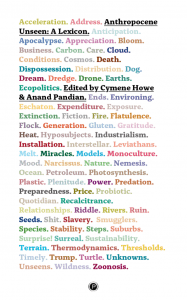 With Anthropocene Unseen: A Lexicon, the editors aim at a resource helpful for this task: a catalog of ways to pluralize and radicalize our picture of the Anthropocene, to make it speak more effectively to a wider range of contemporary human societies and circumstances. Organized as a lexicon for troubled times, each entry in this book recognizes the gravity of the global forecasts that invest the present with its widespread air of crisis, urgency, and apocalyptic possibility. Each also finds value in smaller scales of analysis, capturing the magnitude of an epoch in the unique resonances afforded by a single word.